Poufs There are 25 products. Real life calls for forgiving fabric. Just one more reason to love this cube pouf in red with basketweave texturing. It's wrapped in stain-resistant Nuvella ® fabric that's so easy to care for, it's used on indoor and outdoor furniture alike so you can worry less and live more. Real life calls for forgiving fabric. 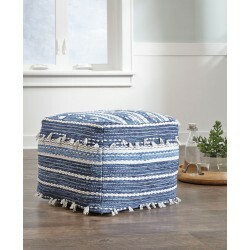 Just one more reason to love this cube pouf in blue. It's wrapped in stain-resistant Nuvella ® fabric that's so easy to care for, it's used on indoor and outdoor furniture alike so you can worry less and live more. Natural beauty is always in vogue, and this pouf proves it. Braided design in natural jute hue and white is simple yet fresh. Stylish stitching and dense filling hold the look together. 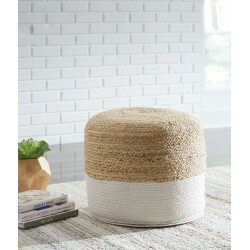 Who said a pouf couldn't be upscale? This pouf fits the bill. Silvertone silkscreen finish glams up the ivory faux fur cover. Dense filling helps hold its shape, keeping your room in style. 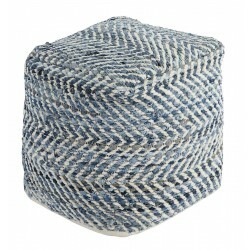 Loaded with alluring texture, this cable knit pouf is knittin' pretty. Fresh hue and shapely design are sure to round out your space in a casually cool way. 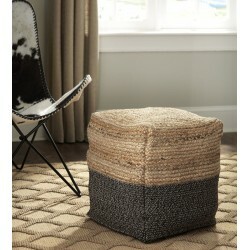 Home fashion reinvents itself in this pouf. Woven texture brings the 90s back in fashion. Shades of blue are appealing to modern-day interiors. Handmade tassel design makes a trendsetting statement. Sit or rest your feet in style on the supportive shape. Sporting a handmade canvas cover accented with faux straps and details, this cube pouf may be square, but it's ultra cool. Two-tone neutral fabric is sure blend beautifully with your decor.